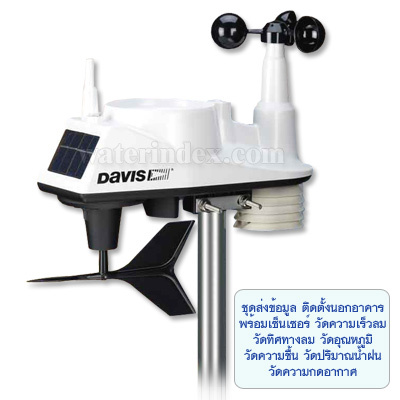 This is a latest addition to rugged, reliable & accurate Davis Instruments weather stations family. The new Davis Vantage Vue weather station combines Davis' legendary accuracy and rugged durability into a compact station that's easy to set up and use. Vantage Vue gives all the weather data that is needed for home, business, education, boating and more. Weather Station includes sleek but tough Integrated Sensor Suite with temperature, wind, and rain sensors and distinctive LCD Console. Outdoor sensor suite sets up in minutes and starts sending data wirelessly to the console. Console's unique Weather Center function provides additional information on each weather variable. Mounting hardware also included; mounting pole sold separately. ISS has wireless transmission range of 1000 ft (300 m). It uses Frequency-hopping spread spectrum radio for continuous data transmission and sends weather data every 2.5 seconds to console. Smaller profile sensor suite is designed to minimize visual impact in yard or on roof. Solar-powered with stored energy backup. Corrosion-Proof and can withstand extreme weather environments. Bubble level for accurate installation and better data collection. wind speeds as low as 2 mph (3 km/h) and as high as 150 mph (241 km/h). Self-emptying tipping spoon measures rain with .01" (0.2mm) resolution US/Metric version). Unique Weather Center button displays additional data on weather variables for today and over the last 25 days.